In the sixth pAsuram, parAnguSa nAyaki says “I am not at the stage where you can enquire ‘should we take her there or not’; my desire has crossed the limits; I cannot sustain myself here; take me to thenthiruppEreyil at once”. My lord who enslaved me by manifesting the dark cloud like beautiful form which is magnanimous by nature, arrived in front of me and stood as visualised [by me]; yet he was beyond the reach of my hand; my love became much larger than the ocean; take me at once to thiruppEreyil where he has arrived and is manifesting his generosity in this world, and where vaidhika practices which are a form of worship of emperumAn are occurring continuously in the presence of distinguished persons who are experts in four vEdhams, and which is having beautiful paddy crops which are swaying like fans and abundant water bodies. kAlampeRa ennaik kAttumingaL – Though this is not the solution for the family, there is no other solution for me. There is no fault in me any more. kAdhal kadalin migap peridhAl – Is my love bounded? You see the word which I used [kadal – ocean]. You are thinking “previously she said in thiruvAimozhi 5.3.4 ‘kadal puraiya’ (ocean like)”. But, this love did not occur to fulfil a particular purpose, it has occurred naturally in me [so, there is no boundary, it keeps growing]. neela mugil vaNNaththu emperumAn – Should I follow you? Or should I follow him? When he appears in front of me to accept me, how can I withdraw myself from him? When he engages me with his divine form, will I listen to your advice? He appeared in front of me with an invigorating form and increased my love. It is his form, which nurtures my love. As seen in thiruvAimozhi 5.3.4, my love grew to the size of an ocean due to his dark coloured form only. niRkum munnE vandhu – Had he not arrived near me, would I not have withdrawn myself listening to your advice? en kaikkum eydhAn – Nice, it will be good if I get him. Not just he is not talking and embracing, he is not even reachable to my hand; they asked “what are you doing now?”, she says “instead of enjoying him through visualisation, I desired to go to the abode where I can physically enjoy him”. 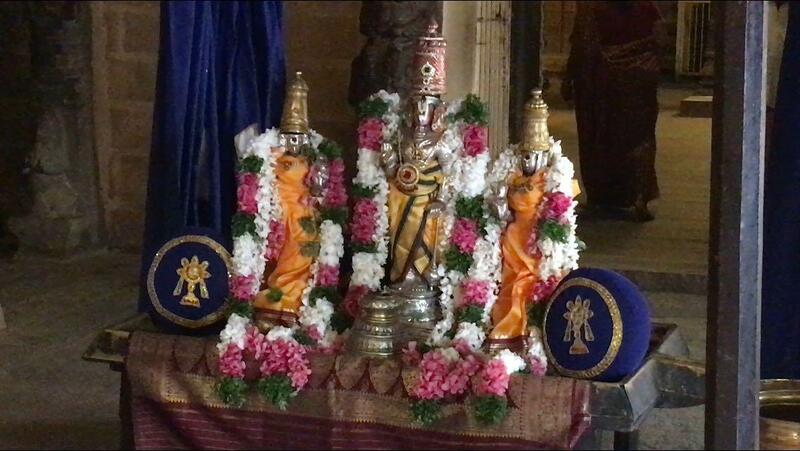 gyAlaththavan vandhu vIRRirundha – Instead of having to travel far and seeing him, he is manifesting all the opulence of paramapadham here in thenthiruppEreyil. nAnmaRaiyALarum vELvi OvA – Even the experts in the principles of vEdham are engaged in worshipping him perpetually. Those who are similar to me, will be engaged in kainkaryam (service) which fit them [instead of doing the worship for other benefits, they will do it as kainkaryam]. kOlach chennel … – The abode is such that they need not put in any effort to get rain, food etc. They will get them consequentially; it is said in perumAL thirumozhi 5.9. “nIL selvam vENdAdhAn thannaiyE thAn vENdum” (Like the wealth that will desire to reach the one who does not desire for the wealth and desiring for you only) and in periyAzhwAr thirumozhi 5.1.4 “angangE avai pOdharum” (they will get food, clothes etc naturally). Beautiful paddy crop will sway like a fan for that abode. kUdu punal thiuppEyiRkE – Having abundance of water due to the confluence of river water, ground water and rain water. thiruppEreyiRkE – Please take me to the invigorating abode and leave me there to eliminate my fatigue. Just as the paddy crop is sustained by water there, she will be sustained by the sight of that abode. This entry was posted in thiruvAimozhi, thiruvAimozhi 7th centum on August 14, 2018 by Sarathy Thothathri.